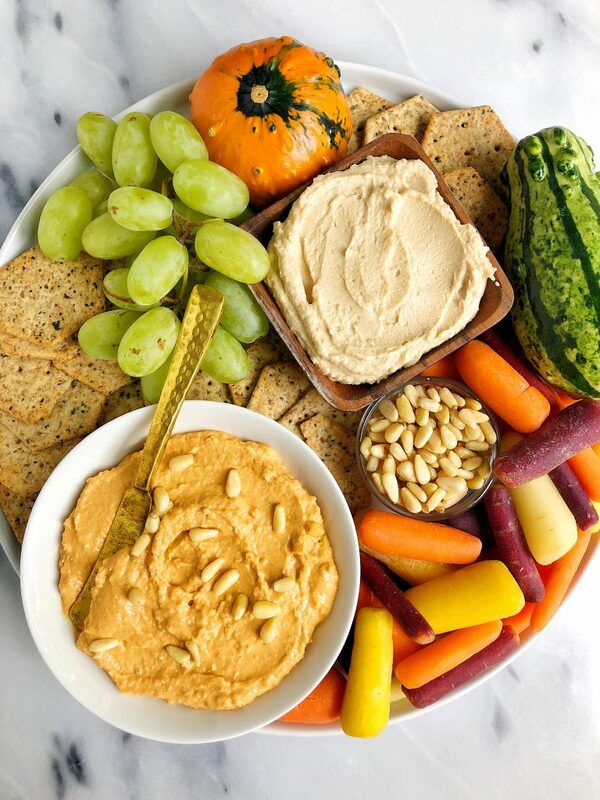 5-ingredient Butternut Squash Hummus made with all gluten-free, dairy-free ingredients for an easy homemade hummus with no chickpeas! No clue what to make for Thanksgiving or even Friendsgiving this year? I gotcha covered in the sweets and savory department friends. 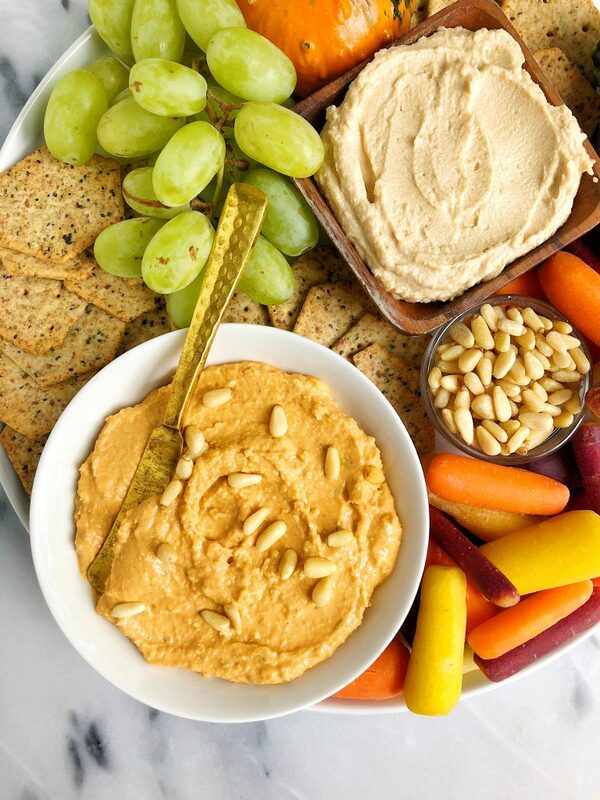 This 5-ingredient Butternut Squash Hummus is hands down the easiest dip to make for the holidays. Plus it is chickpea-less (per the request of many of you for more chickpea-less hummus and falafel recipes) and all you need are 5 simple ingredients plus some crunchy crackers to go with it. Sounds easy enough, right? When I was at Trader Joe’s earlier this week, I bought so much butternut squash and a couple days later realized I have zero idea on what to even make with it. I roasted it up in the oven but as I have spoken about here, I haven’t been feeling roasted veggies during my pregnancy. It is so random – I know. I personally am always looking for a quick and easy appetizer to whip up when friends and family are coming over or when I’m going to a potluck of sorts. I’m all about the quick and easy recipes (duh) so this 5-ingredeint Butternut Squash Hummus will be on repeat all season (and probably there after). All you need to make it is some roasted butternut squash, creamy tahini or almond butter, lemon juice, avocado oil and pine nuts. Plus any spices you’d like to add in like cumin and cinnamon. Bend it all up and serve with your favorite veggies and crackers. I have been loving Simple Mill’s Sprouted Seed Crackers ever since trying the newly formulated ones at Expo East a couple months ago. They are the perfect crunch and they’re extra sturdy to dip into the hummus without breaking into pieces. We keep all the flavors in the pantry and my personal faves are the Garlic + Herb and Everything. Jord on the other hand is all about the jalapeño life. I have no tolerance for spicy so, I try to keep my distance a bit 😉 You can order the crackers in a variety pack here or find them in your local store. They are grain-free, dairy-free and made with the best ingredients (like all of Simple Mill’s products). I wish these were around when I was eating tuna salad on crackers daily as a kid. Most definitely going to be trying that soon on these! Don’t forget to share this dip with me over on Instagram if you make it. And if you are stocked up with Simple Mill’s products at all times like a crazy person (aka me), here are a few of my other favorite recipes using their products: Grain-free Pumpkin Peanut Butter Pie with Cookie Crust, 15-minute Homemade Paleo Bagels and Easy GF Blueberry Panacke Scones. 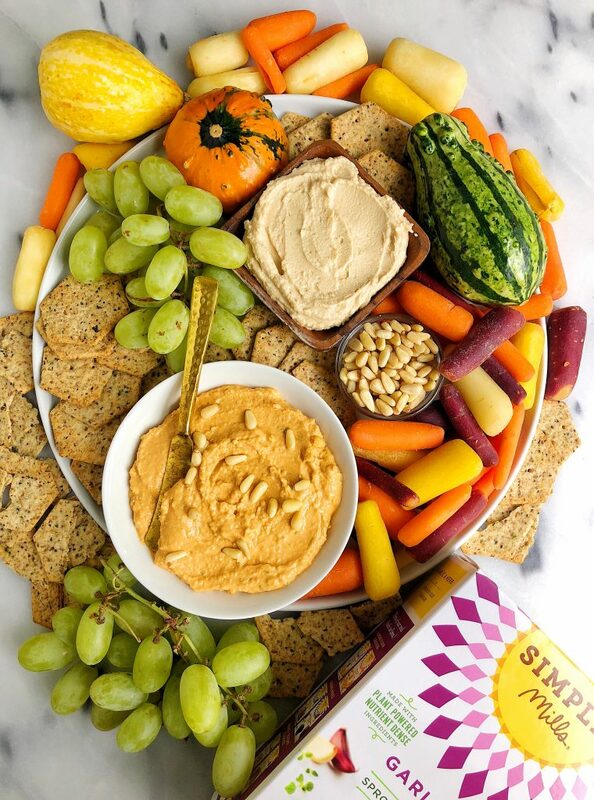 Simple Mills Sprouted Seed Crackers for dipping! Store leftovers in the fridge for 5 days! Thank you Simple Mills for sponsoring this post! It means so much to me to partner with brands I love and believe in here on the blog!